Insurance holding company has made payouts to investors since 1997. Insurance holding company W.R. Berkley (NYSE:WRB) announced yesterday its second-quarter dividend of $0.10 per share, an 11% increase over the $0.09 per share it paid last quarter. The board of directors said the quarterly dividend is payable on July 2 to the holders of record at the close of business on June 11. W.R. Berkley has paid quarterly dividends since 1997. It paid a special dividend of $1.00 per share in December 2012. The regular dividend payment equates to a $0.40-per-share annual dividend yielding 1% based on the closing price of W.R. Berkley's stock on May 21. WRB Dividend data by YCharts. 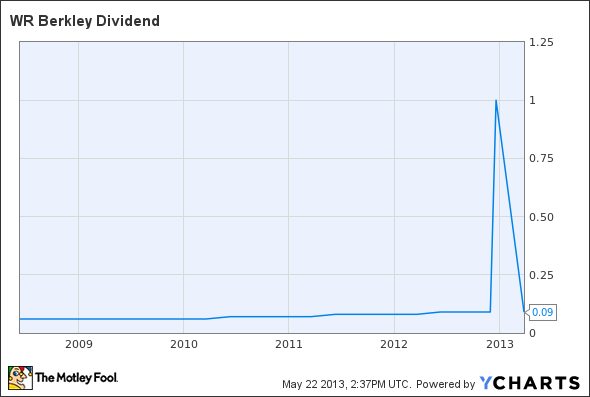 Chart does not reflect just-announced dividend increase, does show special dividend paid Dec. 31, 2012.